If you are searching for “Pool Tile Cleaning“, “Pool Tile Cleaning Service“, “Glass Bead Blasting Near Me“, “Pool Tile Cleaning Company” or “Pool Tile Cleaning Near Me” in Ahwatukee, Arizona, BPC Pool Maintenance can help! BPC Pool Maintenance offers affordable pool tile cleaning services near your local area! Do you have dirty pool tile? We can clean it up and restore your pool tile like new with our pool tile cleaning services! Experience the best pool tile cleaning and restoration, pool calcium removal, pool tile repair and replacement experts in Ahwatukee, Arizona | BPC Pool Maintenance, LLC! Receive a free pool tile cleaning estimate by giving us a call today at (480) 907-7959. 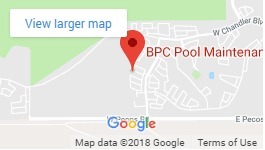 Here at BPC Pool Maintenance, we hold ourselves to a high standard. We will treat your pool as if it is one of our own. Our pool tile cleaning services can remove calcium deposits from pool tile, stone, rock or fountains without harsh chemicals. We only use state of the art equipment and techniques to safely remove minerals, calcium, and other deposits from your swimming pool. Glass bead blasting is the best way to clean pool tiles without contaminating the pool water. Glass bead blasting utilizes a very fine stream of round glass beads that are smaller than the tip of a needle to blast your pool tile clean. We are able to clean grit, calcium and oil off of the grout and tiles of your pool. Glass bead blasting is a method of pool tile cleaning that removes surface calcium deposits by blasting fine glass beads at high pressures without damaging the pool tile. However, some pool tile cannot be cleaned with glass bead blasting because the pool tiles are delicate or damaged already. Salt blasting should be used on delicate pool tile. This type of blasting is great for all types of pools including Pebble Tec pools. The beads are easily cleaned up once blasting is complete on both the deck and your pool. It also doesn’t have any effect on the chemical balances of your pool water. Soda blasting is a type of blasting that normally used on ceramic or stone pool tiles. Although, it can cause the alkaline and pH levels to rise in your pool water. The pool water will have to be re balanced after soda blasting. Soda blasting is another method of pool tile cleaning that uses sodium bicarbonate particles instead of glass beads to blast the tile clean. Salt blasting is a very common method of pool tile cleaning and may be used on delicate, ceramic or sand pool tiles. It is one of the newest and safest methods to clean pool tile and it also creates a shine as if it were brand new. Salt blasting is a method of pool tile cleaning that uses Kieserite (mineral salt) to pop calcium deposits off of pool tile. Salt blasting is done at low pressures and the salt can be vacuumed out after cleaning. This is a gentler alternative to glass bead blasting and does not leave behind chemicals that will throw off the pH balance of your water. Kieserite is biodegradeable and has a neutral pH level. Slat blasting can be used on pool tiles are delicate or damaged already. We clean natural stone, brick, boulders/rock, stone, pebble tec, glass tile, concrete and more. If you are scared of harsh chemicals being in your pool water, then no worries. We have various types of ways to clean your pool that are right for any type of situation. We want to protect your investment and treat it as if it were our own pool. Another one of our services pool owners choose to do while cleaning pool tile is pool draining and acid washing. We already have to lower the pool water below the tile line, why not go ahead and drain the pool, perform and acid wash and pool tile cleaning at the same time. This will get rid of nasty green stains that might be left on your pool walls. Here at BPC Pool Maintenance, we use glass bead blasting to remove calcium buildup from your pool tiles. Call us today at (480) 907-7959 or just simply fill out our online contact form for a free pool tile cleaning quote in Ahwatukee, Arizona area and are interested in a free calcium removal or tile cleaning estimate. If you are searching for "Pool Tile Cleaning", "Pool Tile Cleaning Service", "Pool Tile Cleaning Company" or "Pool Tile Cleaning Near Me" in Ahwatukee, Arizona, BPC Pool Maintenance can help! How Much Does Pool Service Cost In Phoenix?